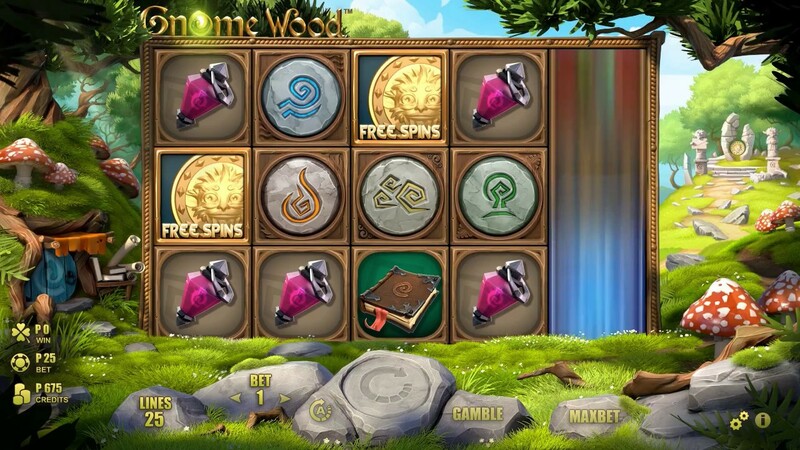 Get ready to let Microgaming take you on an adventure, deep into the magical forest when you play this 5-reel, 25 pay line game Gnome Wood slot. Join the Gnomes in their woodland home and maybe you can uncover some ancient treasures. 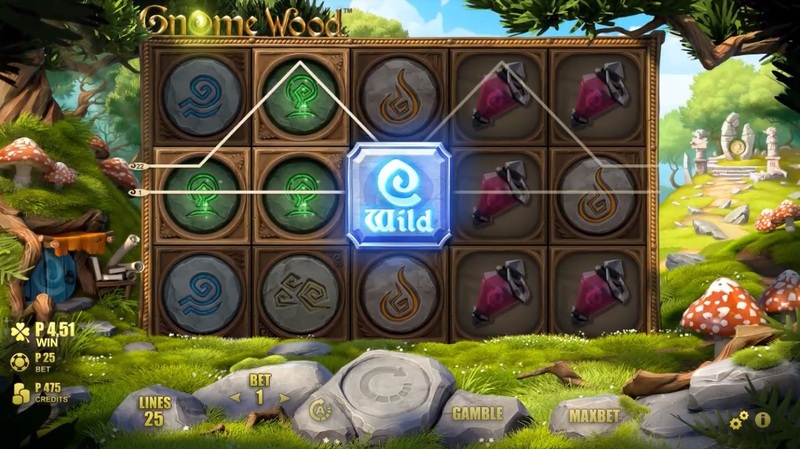 This online slot game is graphically stunning and has the level of detail of a Disney movie or children’s cartoon. The backdrop shows a beautiful scene of the Gnome Wood with a lake, blue sky, trees, mushrooms and little gnome houses built into the side of the trees. There also seem to be some ancient stone sculptures in this magical setting. The whimsical fairy tale music helps enhance the theme further. On the reels, there are runes carved into stone making up different coloured symbols, which seem to be representative of the elements: Earth, Water, Wind and Fire. There is also a cauldron, precious stones, golden coins, a gnome character, a rat character and a spell book. Help these little creatures cast their spells and you may be rewarded generously. If you are eager to get started and head to the world of gnomes, you can play for real cash now at Easy Slots. Find out more! The wild symbol is the first interesting thing to take a look at. There is a wandering wild which replaces all symbols except the free spin symbol. There is also a wandering wild symbol with a double win multiplier. Both these symbols only appear on the last 4 reels when the player initiates the spin. Next is the bonus spins feature which is triggered by the wandering wild symbols appearing on the reels. During this feature, all wandering wild symbols visible on the reels will move one reel position to the left from the previous spin and triggers a re-spin. With every spin, the symbol moves left until it leaves the reel and the spins are completed. The free spin scatter symbol activates 10 free spins when 3 or more appear on the reels. Wandering wilds can appear in free spins and trigger the bonus spins feature. The final special feature to keep an eye out for is the gamble game where you can choose a gold or bronze cauldron. If a magic spell is cast above your chosen cauldron your win is doubled.